or it is simply a manifestation of unknowable evil." DO ANY OF THOSE EXCUSES FIT YOUR ACCEPTANCE OF WARS? Wars in our lifetimes appear to center on the theme of gender. 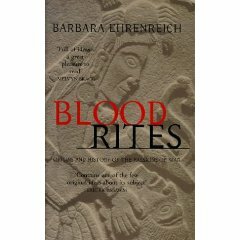 But Ehrenreich searched back in time and found blood rites far more explanatory. She studied the feelings people invest in war and found forms of organized and socially sanctioned violence. Ehrenreich went into considerable depth to inquire about the source of our feelings toward war and how they played out in history. Ehrenreich explores the ecstasy of war as a religion in the papers of other scholars in subjects ranging from mythology to psychology to animal studies to art to science of warfare. She confronts the mystery of our attraction to violence with comparison of various aspects in relation to ancient fears. that has become the greatest single threat to human life. Carefully footnoting her findings and referencing the sources for the reader's examination, Ehrenreich presents a monumental work in her analysis and discovers a new and startling direction of relevant scholarship in the study of violence. In over two hundred and fifty references Ehrenreich pinpoints attitudes and actions of societies from Aeschylus, Stanislaw Andrzejewski, Homer, and Virgil. Authors such as Richard Dawkins, Riane Eisler, Lewis Mumford, Robert G.L. Waite, Dudley Young, Erich Fromm, and James B. Frazer touch on genetics, rituals, psychopaths, ecstasies, human destructiveness, and roots of religion. Dozens of others are cited in publications since 1950 analyzing human behavior from the past about subjects as diverse as evolution, menstruation, symbols, mythology, human sacrifices, aggression, history of war, and warrior-heroes. Many of those are studies published in the 80's and 90's that scrutinize other earlier sources of human actions. for annihilating the human race.